The highest point in Africa and one of the seven continental summits, this was my first foray to altitude, and the furthest I've been into Africa so far. It won't be my last mountain, nor will it be my last adventure on this enigmatic continent. Smells like wood smoke and wild animals. Can hear crickets through the dark. Big sky, but full and bright. Must check out southern hemisphere stars. Roads not bad and the people are friendly. My group seems a good bunch. So far I only have my imagination to go on for the scenery but the odour is intoxicating and the temperature wonderful. Easy to romanticise I know, but I’m excited for what tomorrow may bring. The road is very straight and I'm thirsty! (and as ever, hungry of course) Back was a bit stiff on the plane but there’s plenty of time to loosen it up! I’m so glad I came here. The memory of my flu (no, not just the 'man' variety) is beginning to fade, despite it's severity leading me to conclude that I'd probably never had flu before. The only clue to our being in the right vicinity is the 'Kili-view' pub, lit by yellowed light bulbs and populated by only a handful. In the absence of the real thing, a large billboard advertises the imposing mass of rock with it's white cap and green skirt. A short night’s sleep followed a late dinner of pasta and a somewhat dour briefing, from our expedition leader, but everyone was good humoured through the fatigue and excitement/nerves. Repack bags, leave unnecessary stuff behind. Massive registration/bag weighing queue, used my first ‘hole in the floor’ toilet of the trip and coped admirably. Eventually set out very late, after 1430, then piled out and started the trek an hour early due to a muddy crater in road. Steady-steady, ‘pole-pole’. Winding, fragrant, hilly, green, green, green. Bird sounds, frogs, cicadas, green, perfect temperatures (for walking – 20ish, bit less perhaps), slow pace, very slippery, steady, progression of porters going past loaded to the max, one with a radio, 40 in all, just for our group (9). Good banter between us, our guides Limo, James and Thomas are great. Quiet, but very friendly when you get them going. I took a load of photos and some video but would like to have done more. Physically knackered but feeling much better than I was and fit for the rest. Arrived at camp just as darkness fell. Wow, bustling metropolis! Must be a good 200 people here. Will be interesting to see it in the light. Stars are amazing, would like to do some time-lapse photography framed through the trees but too knackered! Also not sure how that would turn out with all the people milling around with head torches. Dinner very civilised, copious – tea, biscuits, popcorn, leek soup, bread, spaghetti, bolognese, veg sauce, banana, all candle-lit, Good chat. Our British guide seems to have to have relaxed a bit, she’s not hugely knowledgeable about the mountain, and is very quiet but is a genuinely nice person if quite a passive leader, but we’re fine with that - we're not a high maintenance group! Anyway, first night under canvas and the chance for a full night’s sleep. Looking forward to tomorrow. Elephant dung – but no elephants. Beautiful morning, clear skies but one hell of a crowded campsite! Bucket toilet full to overflowing. Didn’t sleep too badly and didn’t wake up with any aches and pains. Slight dizziness as I sat up too quickly but nothing untoward. Loads of noise around the camp so glad of the earplugs. Missed a lot of birdsong (dawn chorus) however. Great breakfast of toast, porridge, eggs and then off we go. Rattled off an unbelievable number of photos and got some good video footage (I think!) For want of stating the bleeding obvious, the forest is soooooooooo green. Not so many flowers (sedoviola Kilimanjaro) Occasional clearing was really pretty. Undergrowth very dense, temps quite cool under the trees, perfect for walking and the sounds were great. Wish I had a sound recorder. More chat with the guides and group today. Limo is good with local info and I had some interesting conversations with the rest of the team. The pace is a lot slower than I would probably walk if I was on my own but I can be as trigger happy as I like with the camera and it’s not wearing me out. Loving it. There are a lot of us on this mountain and the ‘purist’ in me would like to be more isolated but then it’s so worthwhile for the locals to guide/porter that it feels good to put something into their economy (pockets) whilst we have our ‘jolly’ up the mountain. The guides pay US$500 to get their license, so it’s evidently worthwhile. They’re all part of a larger company that hire out guides and porters, operating a kind of taxi-rank queuing system to allocate porters etc to trips. With 5+ of them for every one of us, it’s hard to imagine doing it without their help. And on this occasion I’m glad I’m doing a trip where we’re looked after and I can just amble along and enjoy the view. Good group, great summit views as cloud clears, but not as good as the white-necked raven or my 30” exposure night shot from last night! Dinner, curried chicken and rice and soup. Liking the Milo, the interesting travel/history/natural conversations with everyone. Well, early night - it’s only 2045 but feels right. It’s good to align your body clock with the sun. It definitely feels healthier. I have the blackest fingernails right now but I’m enjoying the grime. It’s dusty here and is like this the rest of the way apparently. This is great and I’m tired so will continue tomorrow. Rubbish night’s sleep. 1st 3 hrs ok but in bed too early, awake again at midnight. Garry snoring again so after 2 hrs of frustration, got up to see the stars. Stunning. The plough on the horizon and bigger than I’ve ever seen it. Shooting stars too. Eventually back to bed for another 3 hrs sleep. Woke up feeling like I had a hangover. Re-hydrated but headache/tired all the way to the next camp. Arrive to a cold and misty campsite, most of us feeling the effects of altitude. Late but amazing lunch of soup and cheese toasties followed by ibuprofen and a siesta – amazing transformation, feel full of energy! Early dinner of beef stew and potatoes followed by birthday cake for Andy. Visit to a CLEAN toilet, amazing sunset over Meru, Kili summit cleared too, stunning evening. Really funny game of ‘guess who’, some more experimentation with night photography and then to bed to write. Best night’s sleep yet. The usual stirrings but no prolonged restlessness. Read both of my little spiritual books at one point however. Slight headache on wake up but cured by water and breakfast. Usual morning routine and away by 0850. Jason still looks terrible but starts 5 mins ahead of us only to be overtaken very quickly. We could still see him behind us for the first couple of hours then we lost sight of him – no news since. Saw a couple of other people coming down the mountain prematurely. Long day!! A plod, a few of us began with that slight hangover again, requiring an ibuprofen. Sam barely slept at all and John carried all her kit. Just a slog really, brief chats with Thomas and James about life, work etc, a bit of info from Limo about plants. An insufficient lunch again, I was definitely feeling the lack of calories by the end of the day. Will now save all my drinks and gels for summit day. Maybe drink something every 15 mins, warm water. Went from warm and clear to mist and hail, to hot again. 8hrs walk up to 4600m. slight headaches and fatigue but we’re all healthy so far for our first night at nearly 4000m. Some very deep and intellectual conversations with Kristina. We share some opinions on life. Pretty good sleep, woken only by the midnight festivities (too cold and tired to get out of our sleeping bags! ), appreciated from the inside of our sleeping bags. Late start due to a shorter day. Had a case of the runs (not that I’ve deposited anything completely solid since I’ve been here) Was aware of this for most of the day but it wasn’t a problem. Barranco wall was fun (if a little crowded, despite having left later to avoid the crowds) and again today, the scenery was stunning. We passed through seneca and scrub with waterfalls and green valleys into moon like landscapes. From warmth to cool mist. It almost snowed. Oh yes, and whilst packing up this morning, heard the roar of an avalanche (sounded like a heavy truck arriving) ducked out of the tent in time to see the clouds of ‘smoke’ billowing from one of the summit glaciers. Cool to watch from a distance at least! Today was tough. Acclimatisation no longer appears to be a problem for most, however the day was too long without food. I must bring snacks next time I do something like this. The group has gelled well, plenty of banter and intelligent conversation. It’s amazing how much I’ve missed that and how little opportunity I get for that at home/work. Very undulating today , the guides usually underestimate the time it will take us on short days but we should be used to that by now! Some steep ascents and descents, but I was pleased to find out I’m no less comfortable on the rock than I was ages ago. Also pleased that the weight of a rucksack isn’t giving me trouble. Eventually into camp, two rapid trips to the toilet! But some immodium and food later I feel much better. More ‘guess who’ and summit talk around the table. I think we’re all excited/nervous about it now. Will be a very long day and I am slightly concerned about the limited water/food availability. Stunning view tonight out to the WSW of a silhouetted Meru. Some storms on the horizon, and a large town that I assume is Arusha. 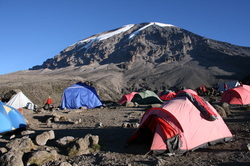 The summit of Kili looms large and clear over the campsite. Looking forward to a good night sleep and feeling fit tomorrow. Onto the summit tomorrow night!! Lala somala bwana. Another beautiful start to the day. The long path out of the campsite was already busy with porters on their way to the final camp before the summit. Boulder strewn and dusty, looks like a long slog today. The air up here is fantastically clear for photos and Meru looks on from behind. The banter is reduced, and the going is quite tough as we soon ascend into the mist and the temperature drops again, the light becoming atmospheric. The trail seems busier today for some reason, and owing to the lack of water at the next camp there are porters moving in both directions to ferry water from Karanga. Barren and very open terrain. Lunar, again. Like another planet. Great view of the camp toilets perched on a cliff edge from a long way below! Barafu is steep, rocky, long and narrow. Stunning angle up to the summit and down the flanks almost to the bottom. Great above cloud views, feels like a mountain now! Food, briefing, repack, bed. Tired, and fall straight into a restless sleep. I become aware of my breathing being very shallow, and after 3 or 4 shallow breaths I stop breathing and then wake up with a gasp and a deeper breath. This repeats itself and I can here Bob doing the same thing. After a few hours of this, we wake 15 mins before 11pm and layer up, 5 layers and my down jacket on top and three layers on the bottom… Michelin man! Tea and biscuits, appetite suppressed and a a little apprehensive about hydration when I get my two bottles refilled. But hey, too late now, time to go! Actually managed to sleep a reasonable amount in the afternoon and only woke up 15 mins early. I really noticed the difference in oxygen level at this altitude. 2 or 3 shallow breaths before thinking you're suffocating (exaggeration) and then a larger ‘gasp’ wakes you up. Very strange. This continued most of the afternoon/evening. Not unpleasant, but very weird and I was glad to get the wake up call for the summit bid. All decked out in 5 base layers, my down jacket and windproof, our bags all packed and rucksacks containing little more than a couple of snacks and two litres of water. All that the guides were advising and pretty much all we could get as this camp had no water supply (this would later prove to be horribly insufficient. I’d much rather have started with a heavier pack and been better hydrated, but more of that later). Tea and a couple of biscuits was all we got and if I’m honest I couldn’t really eat a lot. Nerves, excitement and the memory of a rough stomach during the last 24 hrs stifled my appetite. A dry mouth and ‘hangover head’ also didn’t help. I had mixed up an energy drink with hot water however, and we’d been given a small and as usual inadequate lunch. But enough of the negatives. I popped an ibuprofen and at midnight, we stepped out into the chill air and formed a line behind Thomas. A line of headlamps could be seen zig-zagging up towards the stars and a very black mountain side. Still had a niggling headache but ignored it and away we went. Steady but pole-pole pace into the dark. After 5 days now I couldn’t feel the weight of the pack anymore, but the thinner air was definitely noticeable and anything faster than Thomas’ metronome pacing brought very heavy breathing. The mood seemed subdued as we focused on the heels in front and the rocks underfoot. My world reduced to a small pool of light at my feet and expanded only once an hour as we stopped to drink and gaze out at the stars as I caught my breath. The first hour we scrambled through the steep rocky campsite and into unfamiliar territory. The night so black it was impossible to see what lay before us. Good pace, but in less oxygen and no wind, I started to get warm. 1hr, water stop, nibble some chocolate, another hour, poo stop, false alarm, drink keep going.1/3 of the way there (or so I thought). Another hour (mood) still high, some regular checks of altitude (3 hrs in and steadily overtaking quite a few other groups on the way, perhaps a sign of our better acclimatisation over a slower ascent. All this despite feeling we were moving very slowly. Just focus on the steps, eat a little (gel) at every water stop and keep moving. My head hurt, my stomach feels empty and I’m unsure about whether farting is a good idea. I didn’t quite imagine (I guess I should have) that I wouldn’t feel 100% on this day. Still 4 hours in and we’re all still moving. A couple of the girls have relinquished their bags to Thomas and Limo but we’re all together and still moving steadily upwards. The terrain is steep but not complicated underfoot. Some smoothish rocky sections and other dusty, fine, well-worn scree. Horizon starts to get light, temperature has dropped a little but I’m plenty warm enough and haven’t needed all my layers of gloves. I don’t think anyone found it easy, some would later say that it was the hardest thing they’d ever done, but remarkably (according to Jane) none of us suffered any altitude problems other than minor headaches and a mild case of nausea. Sunrise was a welcome distraction, the light and colours stunning. Mwenzi silhouetted against the glow. We could now see where we were going, and the slow pace of those we’d passed and one or two needing support. I myself was suffering the lack of food and dehydration and Stella Point was still a way off. We’d now been going over 6 hours and I think collective moral was struggling, believing we’d fallen behind the pace. Eventually it came, we regrouped at Stella Point and the temperature dropped as the breeze increased on the exposed ridge. Still, only felt it on my face and we’d begun the last leg… man it was long. We’d been chopping and changing our order as we stopped and started, which was nice as it regulated our pace. Now in full sunlight and clear skies and at over 5700m the terrain was no longer steep but it still took over 1 hour to make the final 100m of ascent. The view is magnificent and the enormity of the crater, glaciers and summit almost unbelievable, and to me, quite unexpected. Still got a headache, dehydrated and with that empty stomach feeling – step, step, step, breathe. James repeatedly asked to carry my bag (he already had Kristina’s along with his own). I refused and kept smiling. He was singing loudly and encouraging (he’s done it well over 100 times in the 8 years he’s been on the mountain) Video camera comes out for the last 5 mins. Heads down for the final few metres. Relief more than jubilation. It is spectacular up there in the clear blue sky. The thing is ENORMOUS! The summit being on one side of a huge volcanic crater. The glaciers are sheer, white and tall. Impressive but somehow, even though I never saw them in their former glory, they feel a bit forlorn and lonely. Dusty, yet ‘clean’. Whilst thin, the air was good and the ‘hugs’ said all that was necessary. One or two tears from some. Flurry of summit photos, hurried along by an impatient American woman. 15 mins maximum before the headache, thirst and hunger reminded us that the privilege of this visit came with a time limit and it was time to head down. 2 ½ hours sliding down scree. Found plenty in my boots later. Now warming up, heading down to camp, tired, thirsty, headache, but goal achieved. Ran out of water (2 litres for 12 hrs, crazy!) On water breaks fell asleep on the hard ground with bag for a pillow (K & me) to be awoken, groggy for the continued descent. Too dusty for many photos unfortunately but also a good excuse cos I was knackered. Looking down slope, camp was visible most of the way. Lucky we climbed in the dark, would have been soul destroying to see the route! Step, slide, step slide. I’m tired. Group split on the way down. K, G, me and Jane at front with Thomas. Eventually after 4 hrs and some brief naps in the sun we stumbled into camp, greeted by Abdullah and some squash, and a hug or two! They’re great at being enthusiastic for you. Easy stroll down to the bus for tip ceremony, hounded by locals hawking tourist souvenirs, beautiful surroundings for the village, banana plantations mainly. Shook hands and said ‘jambo’ to a little boy, got a shy smile from him and a laugh from Thomas. Shower, re-pack, didn’t recognise everyone clean! Swim in the pool, sit in the sun, eat with the guides, they were herded off by Thomas, James (a non-drinking-vegetarian) was fine with that, Limo however was enjoying a couple of beers and looked most put out! Bob and I were going to visit a local market but time was short and by that point we couldn’t be bothered anyway! Was soon time to get the bus back to the airport and onto the plane home. We sat on the runway in Dar on the way home for a couple of hours, where I was sat between two German women, one of which was the most miserable woman I’ve come across in a while! We eventually took off and despite a rammed plane, I found a seat in the row behind, next to a quiet bloke, and promptly dozed off, waking up 7 hrs later for breakfast! Came home to colder temps in Birmingham than on top of the mountain!